When did The Comics Journal get so freakin' fat? Weighing in at one and a half pounds, this 624 page sucker features more of what you love (or hate) about comics criticism: long, detailed interviews and reviews that will take you days to read. Absorbing, or perhaps tedious depending on your mood, this is a beast I’ve been wrestling with for a few months. This issue features an interview with R. Crumb conducted by Journal publisher, Gary Groth. The topic of discussion is Crumb’s illustrated creation story, Genesis. Groth questions Crumb on the development of his technique over the years, his creative process for this project and what led him to begin his adaptation of the ultimate beginning. The interview is followed by a roundtable barrage of praise and criticism from over a half dozen art and culture critics, who either praise Crumb or take the artist to task for a variety of sins. 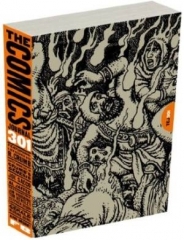 Also featured in #301 are sketchbook/interviews with Tim Hensley, Stephen Dixon and Jim magazine creator, Jim Woodring, from whom Groth seeks to find an answer to the question of why Woodring is compelled to draw such repulsive images. Turns out Woodring doesn't really know. MAD Magazine fans will appreciate the transcribed, transgenerational conversation between the 89-year-old Al Jaffee (creator of the MAD fold-in) and Michael Kupperman (a current pop culture provocateur) in which the two artists talk about art as work, art as satire and art for art’s sake. Adding further heft to the issue is Tim Krieder's argument with himself over the question of whether or not Dave Sim’s epic Cerebus comic should be considered a major work of art? I must admit that I haven't been swayed that it should, but I also haven't made it to the end of Krieder's article and I've only made it through Volume 1 of Sim's 16 Cerebus volumes. But wait, there's more, including an article on comics pioneer and "Dean of American Cartoonists," John T. McCutcheon; an interview with Joe Sacco concerning his graphic novel Footprints in Gaza; reprints of the "Gerald McBoing Boing," strip penned by one Theodore Geisel, aka Dr. Suess; and a slew of other articles, criticism and opinion that I haven’t even gotten to yet—all wrapped in a fantastic Robert Crumb cover taken from his Genesis book.